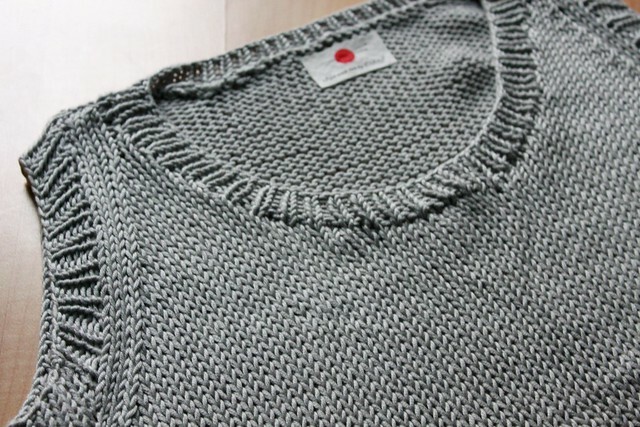 There is nothing more satisfying than wearing a finished knit garment. I’m like a kid waiting for midnight at Christmas once I block a garment. I just can’t wait for it to dry so I can wear it immediately. I have even worn a slightly damp sweater because I was just too happy to put it on but my latest project dried quickly! 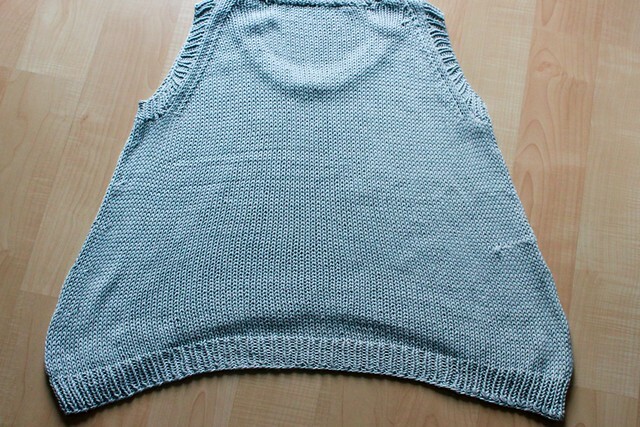 The Togue Pond tank was my 100th project I posted on Ravelry. 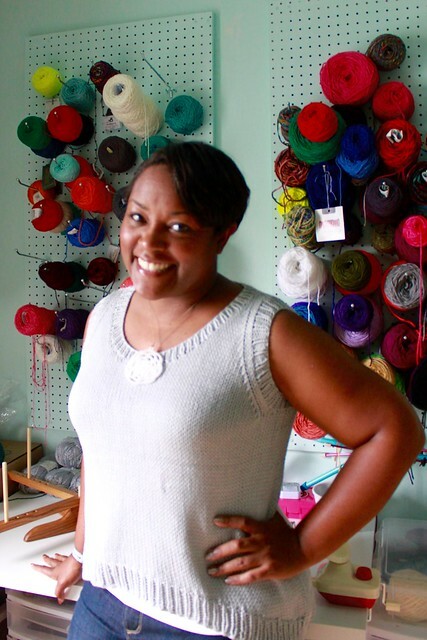 Of course I’ve knit more than 100 projects but it just felt kind of special knowing it was the 100th project on there. It took me just a week to complete and probably would’ve been faster if I hadn’t been on vacation and not knit for a few days (I know, how dare I relax and not knit!). This was my first bottom up construction and what I didn’t like was that I couldn’t really try it on until it was complete. So even though it looks just like in the picture, I hate that it stops right at the top of my jeans – I plan to make this again and add 2 more inches to it before I start the shaping. I love the longer back and I it only took about 2 1/2 skeins of the Berroco Modern Cotton and I’ve got a dark teal, light teal and this light grey leftover, so I’m definitely making a longer color blocked version next! Construction details…my brain needed a few minutes to wrap my head around the strap construction (binding off the middle and then adding a second ball of yarn…) but in the end I got it. I also have a thing for short row shaping and I love how that helped create the loner scalloped back. I also love how the ribbing around the neckline and armholes really finishes the piece off and hides slightly raggedy edges. This yarn is so light and breezy and it drapes beautifully so I am excited to cast on another version of this but with more color. I was trying to step out of my comfort zone and do a neutral but I’m just not a neutral kind of lady! 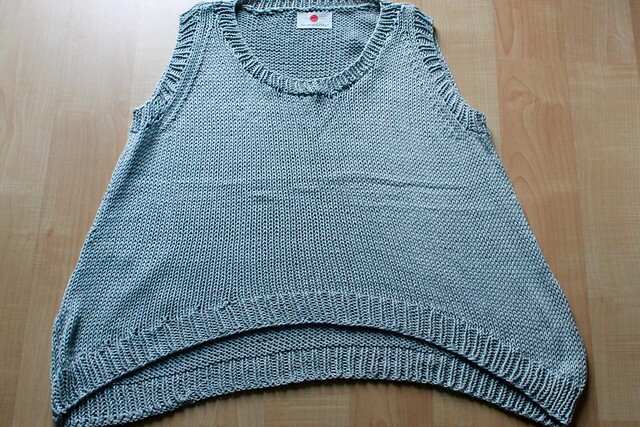 Now I can check another summer knit off my list. Update: Of course as soon as I posted this I find a styling inspiration on how to wear my new tank! Clearly I need to pair this with my bright blue midi skirt and I’ll be so on trend! Any other great patterns for summer? Do share! Previous Post Previous post:It’s A Celebration! Thank you! I really liked this pattern! Can’t wait to make it again! That looks great! So close to running to the LYS and getting some cotton to do one too! I highly recommend it!! It was easy, it’s light and perfect for this nasty humidity in DC! You know what I’ve been up to so I don’t have any pattern suggestions but this is really well done D. I love the fit and if I make it, I’d do your extra 2 inch mod too. Your Togue Pond looks awesome! Love that color combo.